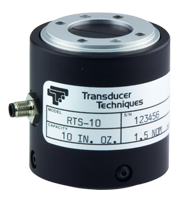 Jun 13, 2008 The RTS Series reaction torque sensor is offered in six ranges from 5 oz/in to 1,000 oz/in. Integrated overload stops are provided for both clockwise and counter-clockwise directions. The sensing element utilizes bonded foil strain gages in a full Wheatstone bridge configuration, yielding excellent temperature compensation and long term reliability. The RTS features four tapped holes on either end to provide for simple mounting in most applications. The accuracy for combined nonlinearity and hysteresis is 0.1% of full scale and repeatability is 0.05%. Excitation voltage of 10 VDC is recommended.